This brew came as part of a mix 12 pack that I bought on a whim. I had never had any Widmer Brother's beers previously, and I thought this would be a good chance to get a sampling of a few beers this brewery has to offer. 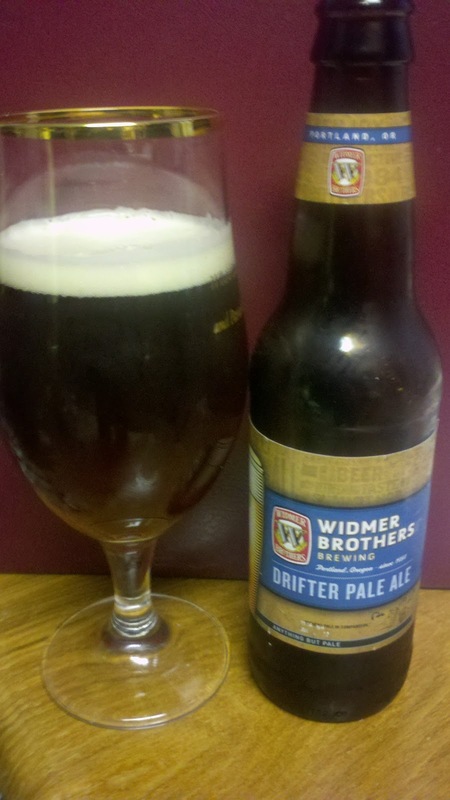 The first brew I am reviewing here is the Widmer Brother's Drifter Pale Ale. The west coast (thanks to Sierra Nevada, Rogue, Stone, and others) has done a very good job redefining what pale ales and IPAs have been commonly known to be. They've all created new, distinct, and diverse hop profiles that keep hop enthusiasts coming back for more and more. I will be the first to admit, I am a hop junkie. I love hoppy, bitter beers more than anything in the beer world. However, I often times can find the overuse or misuse of hops incredily offensive. I wants my hops, but I still want my malt as well. So, when hops are overdone, especially in a pale ale, I get very offended. With IPA's I expect an overuse of hops, but when I am drinking a pale ale I expect more of a balance. So, I was curious to see Widmer Brother's take on a traditional American Pale Ale. I was pleasantly surprised. Appearance: Not a very pale ale at all. In fact, the beer pours a rather dark amber color. Not at all reminiscent of Sierra Nevada Pale Ale or any of the other West Coast vairieties of Pales. There is a nice, finger thick head and generous amounts of loose lacing around the rim of the glass. There is also generous amounts of carbonation. Aroma: Some grapefruit and lemon zest on the nose, followed by faint piney notes. Also, a lot of bread on the nose as well, remiscent of pizza dough. Taste/Mouhfeel: Medium body, a lot more body than other pale ales I am used to. Generous amounts of carbonation help ease out the medium body of the brew. Beautiful hop characters up front such as grapefruit bitterness, but not overpowering at all. Very subtle hop characteristics, that quickly take a step back and allow the pale malts to take over the show. The finish of the beer has the sweetness of thepale malts dominating, resmiscent of a sweet citrusy dessert bread on the back end. Think of lemon bread, with a slight bite of bitterness of the lingering aftertaste. Overall: 8/10 I enjoyed this a lot. However, it was a bit more body than I am used to in a pale ale. This was definitely a darker brew, and far more complex in flavor profiles than most pales that I have had. The balance between malt sweetness and hop characters, however, was excellent and really allowed the pale malts and sweetness to shine through without being overpowered with aroma or bittering hops. A well balanced, delicious pale-ish ale (he he he), that serves as a great salute to pale malt and hops. Cheers!